JACK WHATMOUGH believes ‘on-fire’ Oli Hawkins doesn’t get the credit he deserves. The striker has spearheaded Pompey’s attack for the majority of their League One title charge, keeping captain Brett Pitman confined to the substitutes’ bench. And Hawkins is the Blues’ joint-leading scoring with seven goals – level with Ronan Curtis, Jamal Lowe and Gareth Evans. The ex-Dagenham marksman has been in rampant form, netting six times in his past eight appearances. 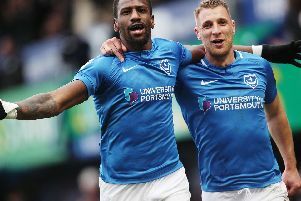 Whatmough revealed how much of a handful Hawkins is for opposition centre-backs – comparing him to League One top scorer Tom Eaves. And the Pompey academy graduate believes the 26-year-old has been key to Kenny Jackett’s side early-season success. ‘Hawks is on fire at the minute,’ said Whatmough. ‘Ronan always gets the credit but Hawks doesn’t get enough. He is such a big platform for us to build off. ‘We know we can just hit him straight away and something will come from it, or we can get the ball to his feet. ‘Hawks doesn’t get enough credit that he actually deserves. ‘We played Gillingham a few weeks ago and they’ve got Tom Eaves. They are the same sort of player and I know how hard it is to play against someone like that. ‘Hawks is doing that for us and that is exactly what we need. Don’t get me wrong, what Brett did last season was unbelievable. Hawkins netted just once in his opening 14 games this term. But he’s swiftly increased his tally to seven, which Whatmough feels is a superb return. The centre-half added: ‘Strikers get judged on their goals but I don’t think you can judge Hawks on that.